Individuals interested in learning how to grow, harvest and market cut flowers are invited to attend a specialty crop field day on Wednesday, Sept. 19, 10 a.m.-3 p.m., at Greenlight Farm in Prairie Farm. 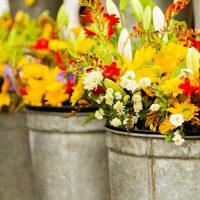 “We’ll be covering production techniques, flower varieties, markets for cut flowers, harvesting techniques and more, and all attendees also will receive a packet of related resource materials to take home with them,” said Kietra Olson, manager of DATCP’s specialty crop program, which is coordinating the event. Located in northwestern Wisconsin, the family owned Greenlight Farm grows more than 40 varieties of flowers which are sold to wholesalers, florists and through a subscription service. http://somethingspecialwi.com/events/details/cut-flower-field-day-1663. The registration deadline is September 16. For more information, contact Kietra Olson at Kietra.Olson@Wisconsin.gov or Angie Sullivan at Angie.Sullivan@Wisconsin.gov.